The Oklahoma Sooners won the 2016 NCAA Division 1 Softball Championship with an exciting 2-1 win over Auburn in game three of the Championship Series. 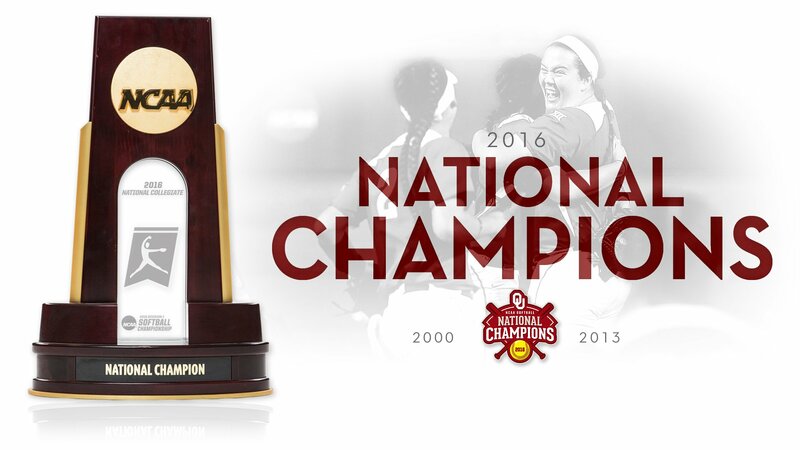 It was the third National Championship for Oklahoma after winning in 2000 and 2013. Oklahoma (57-8), as they had done in both games 1 and 2, started the scoring. A one out single by Caleigh Clifton was followed by two throwing errors on Game 2 heroine Emily Carosone that allowed Clifton to score. Fale Aviu brought home Shay Knighten two batters later to make it 2-0 Sooners after one inning. Auburn (58-12) started the top of the second with straight singles, but went down in order to end the bright start to the innings. The Tigers had an even better opportunity in the third with an error by Oklahoma’s Paige Parker allowing Victoria Draper to reach first. Singles by Tiffany Howard and Kasey Cooper loaded the bases for Carosone, but she struck out and a double play ground ball by Carlee Wallace ended the scoring chance. Auburn finally broke through in the top of the third with a rocket of lead off home run by Jade Rhodes. That made it 2-1 in favor of Oklahoma while Parker would give up a walk to force some action in the Sooner bullpen. Parker got out of the inning with no further damage by retiring the next three batters. Oklahoma had a chance to pad their 2-1 lead in the bottom of the sixth with two on and two out, but a Lea Wodach ground out ended the inning. The top of the seventh started with Parker striking out Madi Gipson. Parker then induced a pop out from Whitney Jordan before a nerve racking 11 pitch at bat to Courtney Shea led to the Championship clinching victory. Parker (38-3) went the distance giving up just the one run on five hits while striking out 5 batters to win her 27th straight start. She was named the Tournament’s Most Outstanding Player after going 10-0 in the postseason and 5-0 in the WCWS. The Sooners won 32 of their final 33 games en route to the Title. Jade Rhodes was the sole Auburn player to record multiple going 2 for 3 including the solo shot in the fourth inning. Makayla Martin went a solid six innings giving up two runs on five hits. The Tigers were attempting to win their first softball National Championship. Oklahoma becomes the third team to win at least three National Championships after UCLA and Arizona.